This is our extended take on the classic “Hello World” application to show an aspect of how extensions can interact with the web. 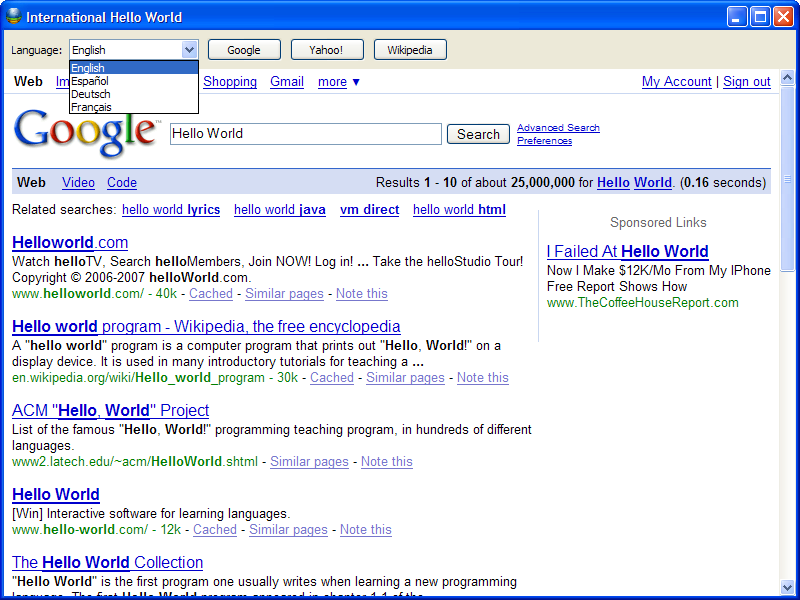 The extension opens a separate web browser window and enables you to select “Hello World” from Google, Yahoo or Wikipedia in four different languages. It is meant to be an example extension, which shows how to create a tool with web connectivity, buttons and combo boxes via a script. 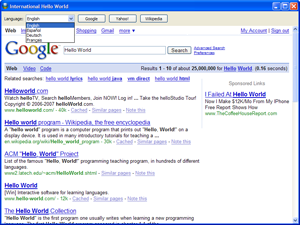 After installing, select “Hello World” from the Tools menu; a new browser window will appear that shows a Google search for Hello World. Select the Yahoo! button and this same “Hallo Welt” search will be performed via a German Yahoo search. As stated above, this extension an example of using a form created locally in Strata to access the Web, rather than adding a valuable tool to Strata. For further information on packaging extensions, pre-built script components, as well as some variations on this specific extension, please visit the Extension Wizard.